This loop ride is similar to the Cherry Creek-Heather Garden Loop that appeared in Great Road Rides Denver. When it was originally produced, I had not yet discovered Lima and Moline streets or Tollgate Creek as better options to ride north and south through Aurora. You can find those routes here and here. 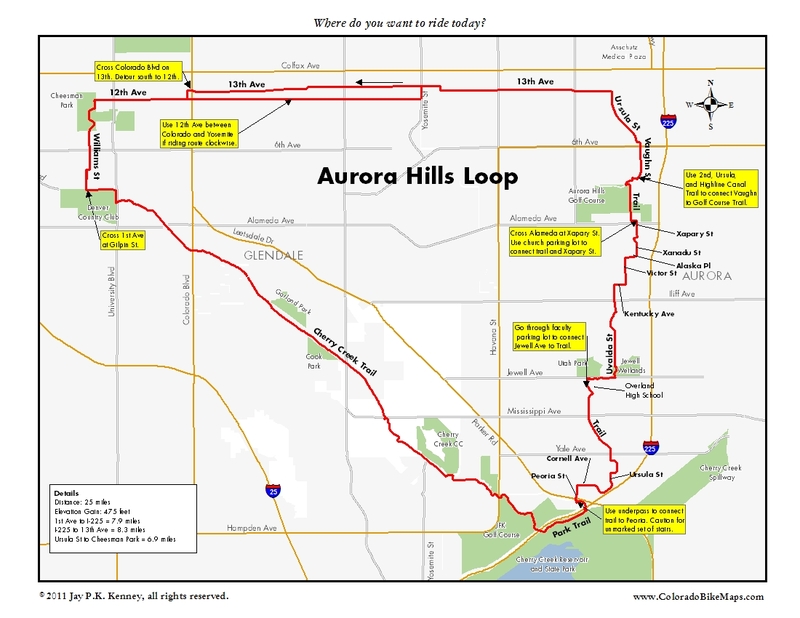 Although this route is probably outdated, I’ll leave it up for the curious–it is an interesting route north-south through a part of Aurora that sees very little traffic. This one came about when a friend asked if there wasn’t a way to do the same ride without riding on Sable Blvd. Sable, in case you don’t know, can be quite busy and the bike lane there comes and goes randomly–usually when you most need it. I started scouting this one more than a year ago and finally think I have it right. The route finding is more than simple, and in a few places indistinct, but mostly if you keep moving north (or south if you’re going clockwise) you’ll be fine. Take this map the first few times you go, and all will be well. You can ride it both directions but it was made to ride counterclockwise to take advantage of the inbound leg on 13th Ave. I know that sounds a little crazy but 13th is a surprisingly good bike route, especially in the off hours. I’ve laid out the directions below assuming you’ll start at 1st Ave and University Blvd, but as with all good loops, you can start and finish this one anywhere. Oh, and the “hills” in the title are a misnomer. There’s a golf course and a subdivision called Aurora Hills, but there are no hills to get in your way. This is a flat and relatively fast route. Head out the Cherry Creek Trail from 1st and University. After you pass under the I-225 bridge, climb east on the Park Trail and look for the underpass under I-225 and into the Nine Mile RTD station. Ride north to Parker Rd, then northeasterly, staying on the sidewalk and looping under the exit ramp from I-225 to the intersection of Parker Rd and Peoria St. This is a very high traffic intensity intersection, so use some heads up thinking when you cross Parker Rd, heading north on Peoria St. If you are coming from the north, beware the set of steps leading into the underpass–they are not well marked and easy to inadvertently ride down (I know, because I did). Ride two blocks, turn right on Cornell Ave and the fun begins. Cornell twists and turns east and north until it a three-way stop. Turn right on Ursula St and keep winding your way north to Yale. Cross Yale and find the sinuous trail that will take you all the way to Overland High School, just south of Jewell Ave. There’s a retirement community just to the east, so use a modicum of care for those with less mobility than you. Circumvent the school to reach the Jewell Wetlands. At the south side of the school, look for the diagonal road west of the school and east of the track field. It will take you northwest to Jewell. Use the street or the north sidewalk to go east to the wetlands, which you’ll see just past the school. Look for a trail running north along the wetland’s eastern edge. Take it. Bomb north to Uvalda St and keep going, crossing Mississippi Ave at the light. Go north to Kentucky Ave, right a block and north on Victor St to Alameda Ave. You’ll see the Queen of Peace Catholic Church on the corner as a cue. The route finding here is a little indistinct, but you want to cross Alameda at Xapary St, which is three blocks east of Victor. You can go north indiscriminately until you hit Nevada Ave and then east, or zigzag from Utah Pl north and east to Xapary. Cross Alameda into the parking lot of the Peace Mennonite Community Church. 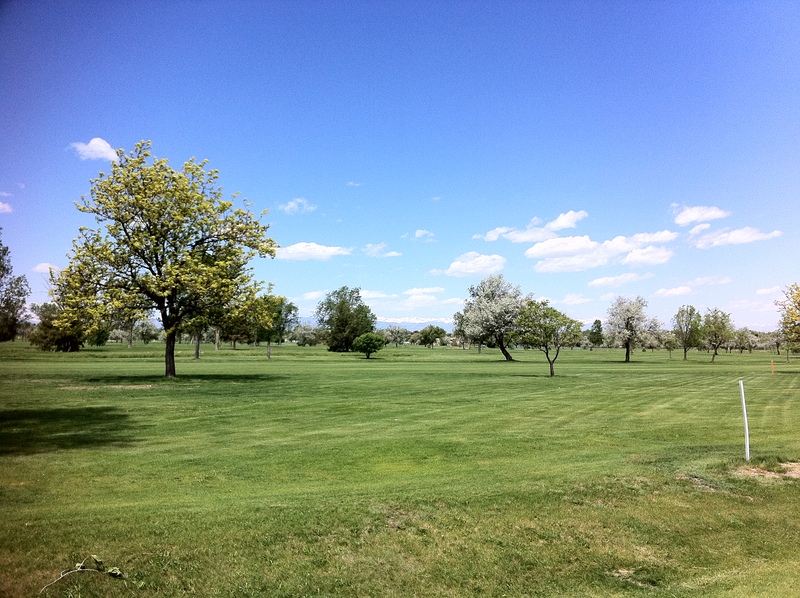 Go north and west through the lot to pick up a tree-lined trail along the west edge of the Aurora Hills Golf Course with great views to the west. The trail connects to the Highline Canal Trail. Go east on the trail then north in two blocks to Ursula St. Ride north to 6th Place, then east to Vaughn St, where there’s a traffic light to cross 6th Ave. Pick any street starting with T, U, or V and go north to 13th Ave. Go west. Two way traffic persists on 13th until Yosemite Ave, then it is all one-way back into Denver. The street is wide, traffic generally light, there are few interruptions, and it is slightly downhill, all making for a fast and enjoyable ride home. Use 12th Ave if this seems intimidating. I usually cross Colorado Blvd on 13th, then detour south at Jackson to cruise along 12th Ave, back into Cheesman Park, then south again through the Country Club neighborhood to rejoin the Cherry Creek Trail at Gilpin St.